Before visiting William's Giftshop I had never seen a hat for an egg. Now I think they are one of the cutest things ever! They are perfect for Easter as well. If you don't feel like cleaning messy food coloring off of your kitchen counter tops, just pop a cute hat on your eggs and call it a day! 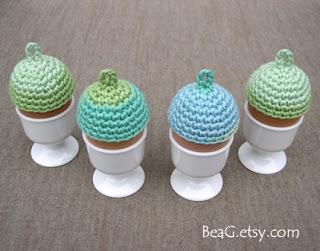 They are made of cotton yarn and do not include the eggs and egg cups that are pictured. Owl pendants are so popular right now. Why have one from your local mall when you can have a vintage piece that none of your friends will have? 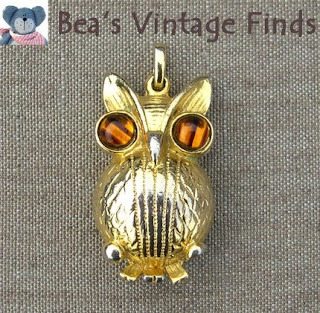 This owl is gold colored metal with glass eyes. It is 1.9 inch. 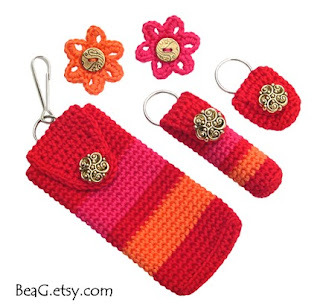 Including 1 keychain cell phone holder, 1 keychain lip balm holder, 1 keychain coin holder and 2 little flower brooches this set would make a perfect present for a friend or even perhaps for yourself! We are at the end, so you all know what that means-the weekly giveaway item! 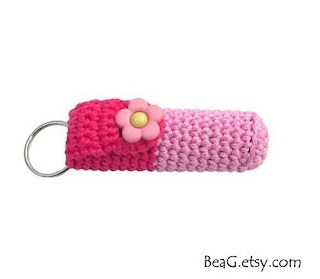 This week William's Giftshop is offering this too cute keychain lip balm holder, your choice from the ones offered in the shop. 1. Go to William's Giftshop at Etsy.com. Come back here and comment about your favorite item in the shop. Entries will be accepted until Friday at midnight. Check back this weekend and see if you are the winner. A little more info about the shop. Even though they are in Belgium, William's Giftshop offers shipping to the US, Canada and other non-European countries. Also if you see an item and would like it in a different color, feel free to contact the shop. Cute stuff! I love the owl!